Browse: Home / Sandy Hook shooting: Where’s the proof? The alleged shooting at the Sandy Hook elementary school in Newtown, Connecticut in December of last year has caused quite a bit of friction and disagreement amongst the staff at American Free Press. Here I will attempt to explain my views on this controversial subject, which stand in stark contrast to the position taken by Michael Collins Piper in his recent article entitled, “Internet Rife with Disinformation: “Cyber Shills” working to misdirect, embarrass legitimate conspiracy researchers,” published on page 18 in issue number 43 of AFP’s print edition. Coincidentally, the Sandy Hook scenario mirrors the March 13, 1996 Dunblane, Scotland incident where it is alleged that a “lone gunman”, Thomas Hamilton, entered the Dunblane Primary School armed with four handguns, shooting and killing sixteen children and one adult before committing suicide. Even more coincidentally, in the immediate aftermath of the alleged Dunblane Massacre, the controlled media directed public debate on gun control laws, including public petitions using emotionally manipulative appeals calling for a ban on private ownership of handguns – the exact tactics used by the mass media in the United States following the alleged Sandy Hook shooting. My suspicion of the official narrative explaining the alleged shootings at the Sandy Hook Elementary School began almost immediately. In fact, I speculated on my personal website only six days after the alleged shooting took place that the Sandy Hook “shooting” was an elaborate hoax presented to the public as a real event via the controlled mass media in order to advance a number of tyrannical, un-American political agendas using psychological warfare. The government and media offered no legitimate proof or evidence that a young man named Adam Lanza went on a shooting rampage, let alone that he even existed or anyone was in fact killed at the elementary school. Conflicting and extremely improbable reports dominated the mainstream media reporting of the event on the day and in the weeks following. Inconsistencies within the official narrative were particularly troublesome, including the varying accounts of the specific weapon allegedly used in the mass shooting. In fact, the official narrative that emerged was and remains absurd on its face, and should be considered an insult to any thinking individual. 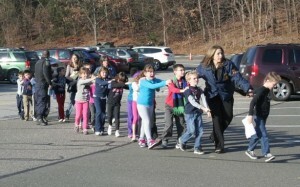 The Connecticut State Police immediately seized all crimes scenes connected to the alleged shooting, including the Lanza home and the Sandy Hook Elementary School. No independently verifiable evidence or proof was offered or presented to the public substantiating the claims that a shooting at the school did indeed take place or that any children or adults were murdered at the school. No crime scene photos, no bodies, no autopsy reports, nothing – just official government press releases uncritically disseminated by the controlled mass media and emotionally manipulative and dubious testimony provided by the alleged family members of the purported victims of the shooting and other “survivors” who escaped the school unharmed. Additionally, I began investigating the testimony provided by the alleged family members of the purported victims of the shooting, including the infamous press conference of Robbie Parker, the alleged father of Emilie Parker, a young 6-year-old girl said to have been murdered by Adam Lanza. The press conference in which Robbie Parker spoke for the first time to the media about his daughter’s alleged death is available online. I encourage readers to watch it if they have not already. I also watched the press conference given by the Connecticut Chief Medical Examiner, Dr. H. Wayne Carver, that was aired by mainstream media outlets including MSNBC, which is also available online. Dr. James Tracy, a professor at Florida Atlantic University specializing in media history and analysis, wrote a provocative essay entitled, The Sandy Hook Massacre: Unanswered Questions and Missing Information in which he transcribed many of the more bizarre and questionable statements made by Dr. H. Wayne Carver during the press conference explaining his investigations into the alleged shooting. Dr. Tracy’s analysis of the Connecticut Chief Medical Examiner’s testimony argues that, “The multiple gaffes, discrepancies, and hedges in response to reporters’ astute questions suggest that he is either under coercion or an imposter.” Again, I encourage readers to watch Dr. Carver’s press conference if they have not already. Do Dr. Carver’s statements, actions, and behavior appear credible to you? Professional analysts do not simply believe the news or what a government spokesperson says. They collect and evaluate the credibility of evidence, and choose from among several alternative hypotheses in order to arrive upon the most plausible as likely explanations for the evidence being analyzed. This is also the function of a court of law – to settle disputes and find facts. One way of doing this is to evaluate all reasonable hypotheses and reach conclusions about their relative likelihood, based on all available evidence – not merely cherry-picked evidence that supports a preconceived or favored point of view. This article was first published on John Friend’s Blog.